For the first year, every student in a redesigned section was portfolio eligible and turned in a portfolio at the end of the semester. In previous semesters, WU’s and F’s were received not because students failed the portfolio scoring, but because they either (1) failed to turn in a portfolio, (2) did not complete enough work to turn in a portfolio, or (3) stopped showing up to class. 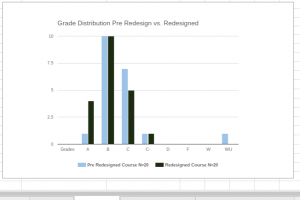 As the chart below shows, all redesigned sections had 100% turn-in rates. I’m interested to see if this trend continues in future courses based on the redesign. If so, we’ll see a positive correlation between the technology use and student engagement. Although only one of my sections was my “official” redesigned course — I implemented the redesign across all three sections of that same course. I’d like to illustrate the success of the redesign across all of the section of English 103 by comparing the grades across all three sections with my Spring 2016 sections of the same, but non-redesigned course. New ways to manage time: Now that activities were split both in-class and out of class (other than homework) students had to find new skills to manage their time effectively. Conducting Peer Review outside of class on VoiceThread, for example, required them to do solid work without me timing them like I would have in class. This actually led to them spending more time on peer review than the normal 20 minute constraints in class. Don’t be afraid to make mistakes! Sometimes there are technological hiccups, and sometimes those hiccups happen during class, but modeling for students how to stay calm and find resources to resolve the issue is a great learning experience. Be organized. Having everything set up ahead of time (even just the week before) helped for things to run more smoothly and t0 clear out any bugs before assignments were due. Include some “low stakes” assignments to practice with the technology. By allowing students to practice with the online tools, such as VoiceThread in a lower stakes environment (i.e. doing a response to a slide to practice using VoiceThread before moving on to using it for a class discussion and then on to using it for Peer Review) first helped students to grapple with and take risks with the technology more easily. It also worked out computer, phone, and other technology issues on an assignment not worth many points, so that they had it down for the higher stakes assignments. Time management: Balancing online presence, with in-class and office presence, as well as having a (second) child during the fall semester, made for a busy redesign time. What this meant was allocating my breaks to course design and practice implementation so that the courses could run as smoothly as possible once the semester began. What this meant was learning about setting more explicit boundaries for when my students could expect feedback on their writing and contribution to the course. However, moving many of our activities online actually helped me more efficiently use my time during the semester. Online discussions and Peer Review via VoiceThread: by having students participate in discussions using voice and video on VoiceThread, they had more opportunity to connect with each other outside of our face-to-face class time. Revision opportunities: by hosting our writing assignments on Google Docs, I could monitor students revisions on their work and step-in when needed. It also allowed students and I to conference about their work and offer revision strategies outside of regular class hours. Online office hours: students having a way to meet with me online (via Google Docs, VoiceThread, or Zoom) allowed those students not usually able to visit me in my office still engage with me as their instructor. It also made any group work (such as Peer Review) easier to organize, conduct, and participate in. In face-to-face classes, using “think, pair, share” strategies to begin discussions and then continue those discussions through our online tools. 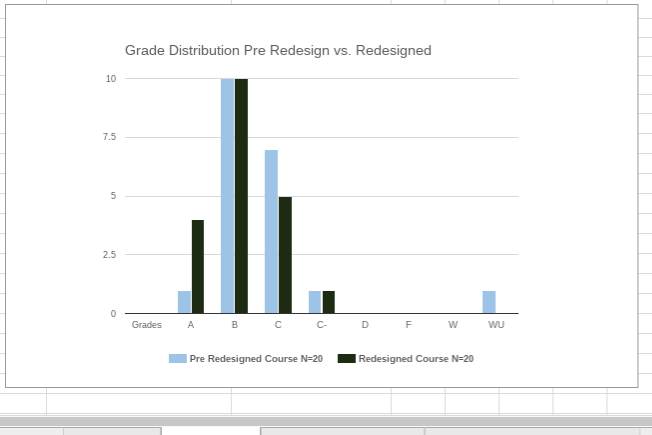 Overall, the Course Redesign with Technology enhanced my class overall. 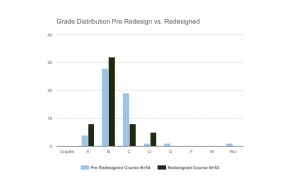 It increased student engagement as shown by the lack of WU’s and W’s across the course. It also increased student success in the course. A’s received doubled and failing grades were cut out. Because of the increase in engagement and the ability to conference, speak with, and check-in on students in various ways that enabled me to reach normally hard-to-reach students, my class success became huge. 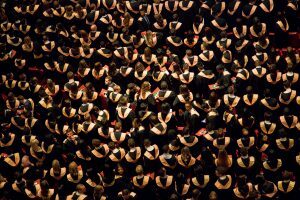 This is highly important since students’ success in the first-year writing course can be indicative of their future graduation rate. 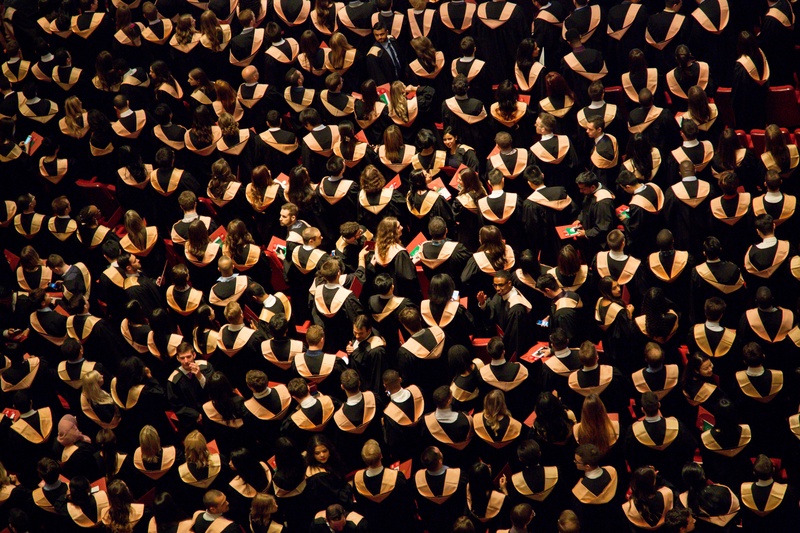 Joseph B. Treaster discusses this issue in his New York Times article, “Will You Graduate? Ask Big Data” from February 2, 2017. When looking at University of Arizona, he found that “a high grade in English comp proved to be crucial to graduation” where “only 41 percent of students who got a C in freshman writing ended up with a degree, compared with 61 percent of the B students and 72 percent of the A students.” When talking with a senior vice provost she found that, “‘It turns out, a C in a foundation course like freshman composition can be an indicator that the student is not going to succeed.” This research shows us that not only lowering the number of students who fail the course, but also increasing their success in their overall grade, can help students in the long run.